The mangroves of Mozambique are ranked 13th in mangroves world rank, and, with more than 3000 km2 they make about 2% of the global area. 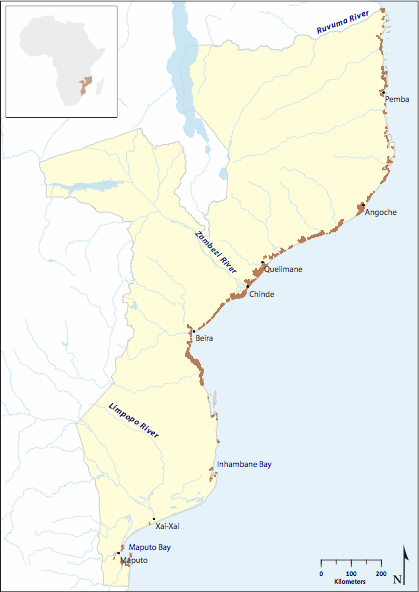 The forests are distributed all along the coast, with specific variations related to the environmental conditions: the predominantly sandy southern coast has scattered forests, most important growing in Maputo Bay, Inhambane-Morrumbene complex, and extended Save delta; the central muddy coast holds the most important mangrove formations of the country which goes from the northern Bank of the Save river up to Angoche further north; in the northern coral coast mangroves occur particularly in embayment’s and islands, some of the most extensive formations being in the Rovuma estuary, Ibo Island, Pemba Bay and Lumbo. All the 8 true mangrove species that are common to the region also occur in Mozambique: Avicennia marina, Bruguiera gymnorhiza, Ceriops tagal, Heritiera littorali, Lumnitzera racemosa, Rhizophora mucronata, Sonneratia alba and Xylocarpus granatum. Mangroves are recognized as important systems in the country, providing several socio-economic and ecological services to the communities. These include nursery function, primary production, coastal protection, and carbon sequestration. Mangroves are also important providers of woody resources, fishing ground area for invertebrates and several economic activities are developed inside these forests (eg. honey production, eco-tourism, salt production and aquaculture). The main threats to mangroves in the country are human related, most important being deforestation for wood resources, urban expansion and coastal development, saltpans (particularly in the north of the country and Maputo Bay area). Natural phenomena (cyclones and floods) were also responsible for the loss of several hectares of mangrove. The country is currently engaged in several mangrove recovery initiatives, which include protection in Marine Protected Areas (MPAs), mangrove replantation and hydrological restoration and inclusive management models. The National Strategy and Action Plan for Mangroves Management in Mozambique” is also in its late stages of preparation.